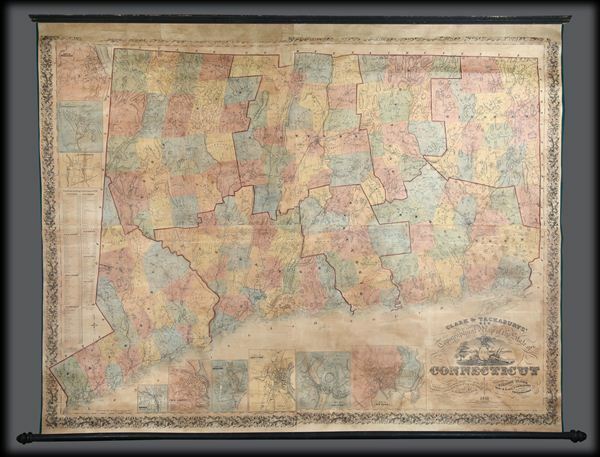 One of the most highly detailed 19th century wall maps of Connecticut ever made. Clark and Tackabury's New Topographical Map of the State of Connecticut. An attractive 1859 first edition example of Richard Clark and Robert & George Tackabury's important wall map of Connecticut. The map covers the entire state of Connecticut with impressive detail including topography shown by hachure, color coding by county and township, notes on railroad lines, rivers, and roads, countless depth sounding all along the Long Island Sound, and multiple insets of Connecticut cities. Drawn on a scale of 1.5 miles to the inch, Clark & Tackabury's map purports to be the most complete map of Connecticut ever published, identifying 'the location of all public buildings, churches, school-houses, manufacturing establishments, and private residences'. Nine insets focus on the cities of Norwalk, New London, Bridgeport, Hartford, Norwich, Middleton, Waterbury, Norwich, Waterbury, Stamford and New Haven, where Yale College is identified. To the left of the map proper are 1850 census population statistics for both counties and cities arrayed in a table. Cartographically this map is an amalgam of older maps and new private survey work produced by G. M Hopkins and Company of Philadelphia. The countless depth soundings along the Long Island Sound are drawn from the U.S. Coast Survey's work in this region. This is one of the last great wall maps of Connecticut in the 19th century. This map was printed in Philadelphia and sold by subscription in both wall and case format from March 2, 1859. Richard Clark (fl. c. 1850 - 1865) was an American cartographer active in the middle part of the 19th century. Though he seems to have been based in Philadelphia, most of Clark's work was compiled in conjunction with other publishers and focused on Connecticut and Massachusetts. Clark is associated with several maps, but his most important are a wall map of Fairfield County, Connecticut, and Connecticut itself. Little is known of Clark's life. G. M. Hopkins and Co. (fl. c. 1865 - 1943) was a Philadelphia based civil engineer and surveying firm active in the middle part of the 19th century. Hopkins and Company, working with cartographic publishing figures such as Henry Francis Walling, Robert and George Tackabury, Gray, and Robert Clark, was part of the middle to late 19th century effort to create highly detailed privately published maps and atlases of American states, counties, cities, and towns. Many of these early maps, most of which focused on the Middle Atlantic and New England States, relied on original independent survey work done by figures such as Hopkins and others. The maps were then sold door to door by subscription in their focus areas. The G. M. Hopkins Company which continued to produce surveys until 1943. Good. Professionally restored and backed with fresh linen. Original rollers. Part of top border missing - see image. Measurement includes rollers. Thompson, E., Maps of Connecticut for the Years of the Industrial Revolution, #181.